In addition to the new searching, browsing and back up features for office documents (Finder, Dock, Quick Look, Cover Flow, Spotlight, Time Machine) and new support for collaborative information sharing (Mail, iChat, iCal, Server), Mac OS X Leopard also advances support for audio and video media in QuickTime, iTunes, Photo Booth, Front Row, and other applications. Here's what's new in Leopard and where the ideas behind rich media on the desktop came from. This report goes to great lengths to explore the origins, history, and maturity of rich media on the desktop. For those readers with limited time or who are only interested in what's due in Leopard, you can skip to page 4 of this report. After Steve Jobs left Apple in 1986 to begin work on an advanced workstation system that would provide the "NeXT" advances in computing, a significant number of engineers and designers from Apple followed him, hoping to start work on something truly new and exciting. NeXT focused much of its attention on solving the issues the Mac operating system was about to run into: limited hardware portability, a weak underlying operating system foundation, and the complications it posed for software developers. While NeXT worked to solve many of the underlying problems of the Mac platform, Apple continued its own plans to extend the range of the Mac's application-level software. 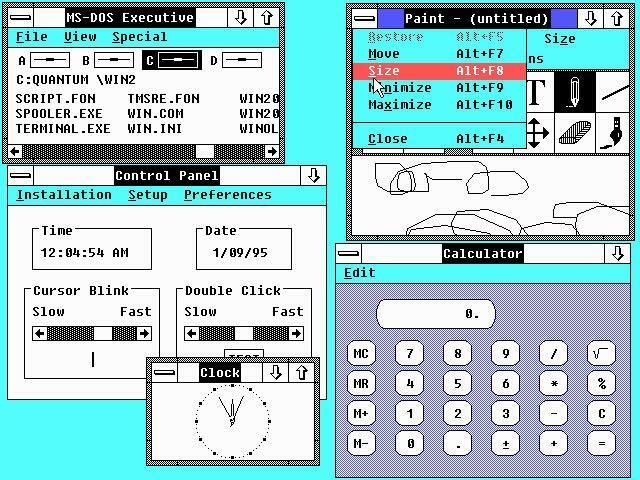 In 1987, Apple's Color QuickDraw replaced the Mac's original drawing routines with an improved architecture. While being backwardly compatible with most existing software, it added support for color graphics and video. Color QuickDraw initially only supported 8-bit pixel depth (a palette of 256 colors), because all color graphics hardware was prohibitively expensive at the time. The high price of 8-bit color came from its requirement for at least eight times the video RAM compared to the original Mac's 1-bit black and white graphics; the additional demands of moving those extra bits around also required dedicated computational processing power similar to or greater than the Mac's own main CPU. 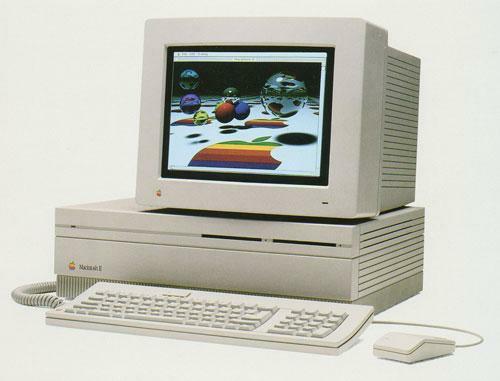 The 1987 Macintosh II (above) cost $4000 - $5500 and supported 256 colors (from a palette of 16 million) on a 640 x 480 display, using a video card that was sold separately for a couple thousand bucks. However, that was at a time when a $3000 DOS PCs only supported EGA, with 16 colors (from a palette of only 64) at 640x350 (below, in Windows 2.0, 1987). IBM's new PS/2 line introduced the new VGA PC standard that year, which offered a 640 × 480 display with 16 colors or 320 × 200 with 256 colors, but those high end desktop PCs cost $6000 - $11,000. Macs weren't expensive; expensive hardware was. Analysts with selective memory frequently forget that Macs didn't actually cost more back then, they just delivered a lot more in terms of hardware, large related to graphics. Similarly, NeXT's $6500 Cube wasn't comparable to $6,500 PCs of the day; there simply wasn't anything that even approached it. Color graphics cost so much that NeXT initially released its first computers using 4-bit color, providing 16 shades of grey. This gave it a distinctive monochrome display, and allowed it to dedicate its video RAM to provide a larger display resolution, commonly 1120 x 832. Jobs announced he wasn't going to do color until the technology was available to do it right. Apple's profitable hardware sales to high end creative users enabled it to invest heavily in new software development. in 1989, Apple released 32-bit QuickDraw, which delivered modern 32-bit (16 million color) graphics. 24 bits were devoted to color information, and 8 bits were reserved for an alpha channel, which defined translucency. Using 'alpha bits,' graphics could spell out compositions that layered independent images over each other without fully obscuring the lower layers. Apple's 32-bit QuickDraw also standardized the mess of incompatible graphics hardware being offered at the time; it simply drove incompatible graphics cards off the Mac market. The PC market continued to labor under incompatible graphics hardware, application software, and limited operating system support. This was one aspect of why it took Microsoft ten years to duplicate the Mac desktop on the PC; it had to account for such oddities as non-square pixels and incompatibilities between vendors all trying to sell the cheapest hardware possible. In 1991, just as Microsoft was making headway with its first commercially viable version of a graphical desktop with Windows 3.0, Apple's Bruce Leak demonstrated QuickTime 1.0 as an upcoming new component for Mac System 6, raising the bar tremendously. 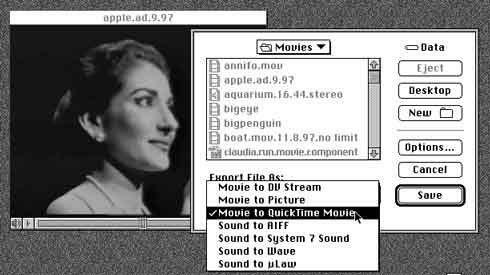 QuickTime wowed the audience by playing back the "1984" commercial on a Mac at a time when Windows PC makers struggled to standardize on simple audio playback. Later that year, Microsoft announced the Multimedia PC initiative to deliver a standardized PC platform and shipped its Multimedia Extensions for Windows 3.0 to provide support for standard sound cards and CD-ROM players. a container file for holding independent tracks of audio, video, text, metadata, timecodes, and other temporal information. system routines for displaying, capturing and editing media tracks while keeping them all in sync. a codec plugin architecture for adding support for new file formats. tools to magically translate content between codec formats. a development environment for creating audio and video productions, controlling the playback interface, and orchestrating interaction between different types of media. The original Macintosh had found its niche in print publishing. Its graphical interface allowed it to do things commodity DOS PCs simply couldn't. As Microsoft began selling Windows 3.0 in 1990, it signaled its intention to not only move its own Mac Office applications to Windows, but also influence Adobe and other Mac developers to migrate their print publishing software to Windows, leaving Apple without any differentiation in the market place, and stuck only with the extreme high end of the market. At the same time, Microsoft told DOS developers to port their apps to OS/2, ensuring that the majority of first generation apps on Windows would be transplants from the Mac, and primarily Microsoft's, as noted in How Microsoft Got Its Office Monopoly. Apple had invested in QuickTime in order to retain its competitive advantage in the future. Like Adobe's PostScript for print, QuickTime unlocked the potential for an entirely new class of multimedia applications. Apple released QuickTime 1.0 (below) for Mac System 6 in December of 1991; in 1992, Apple announced the development of QuickTime for Windows to extend its reach beyond the Macintosh. On Windows, QuickTime would be playback only, maintaining media development on the Mac platform. It delivered QuickTime 2.0 (below) first on the Mac and then on Windows in 1994. Since QuickTime was such an integrated component of the Mac System Software, the Windows version had to include a direct port of a lot of the internal Macintosh Toolbox code. It consequently largely bypassed Windows to talk to the video hardware directly, delivering impressive playback performance on both platforms. Concerned about Apple's encroachment upon the PC market it intended to control itself, Microsoft released a competing product called Video for Windows at the end of the following year. 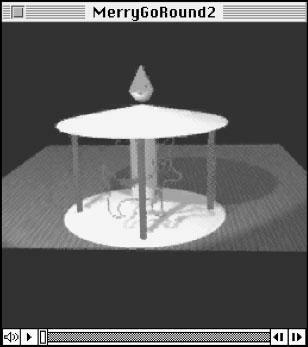 It couldn't match QuickTime's performance because Windows had never been designed to work with media; VfW was also constrained by the incompatibilities and inconsistencies of PC hardware, just as GDI--the Windows drawing routines modeled after the Mac's QuickDraw--had been over the previous half decade. When Microsoft requested a free license for QuickTime for Windows in 1993, Apple refused; the two companies were still locked in a court battle over Microsoft's appropriation of the Mac desktop, and Apple didn't want to get its second wind knocked out of it. Intel, hoping to accelerate the development of media work on commodity PCs--and fully aware that Apple had contracted with San Francisco Canyon to port portions of its QuickTime technology to Windows--approached Canyon to develop a video driver that would provide Microsoft's VfW with similar performance to QuickTime. While Intel knew that Canyon possessed Apple's code, it did not specify that Canyon needed to do clean room development, and gave the company an unrealistically short timeframe to develop the new code. Canyon simply delivered Apple's code to Intel, which then licensed it to Microsoft. When Video for Windows suddenly improved in 1994, Apple investigated and found that Microsoft had simply stolen code from QuickTime in order to compete with QuickTime. Apple sued Microsoft and won an injunction that stopped it from distributing portions of the stolen code. The case was eventually resolved as part of the 1997 agreement between the two companies, detailed in Mac Office, $150 Million, and the Story Nobody Covered. On page 2 of 4: Expansion of the QuickTime Parachute; QuickTime Reborn; Microsoft Goes On the Offensive; and The Tables Turn for QuickTime.